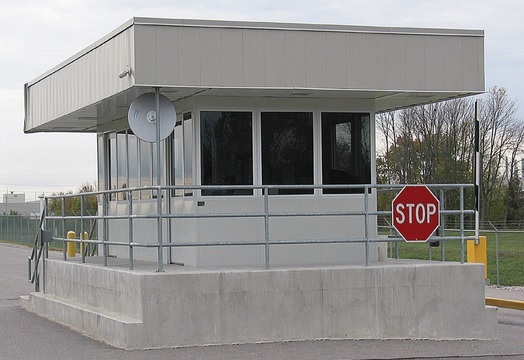 Guard houses can be guard booths, guard shelters, border inspection booths, ticket booths, security-access checkpoints and observation or visual towers. These are an important element of any business or organization as by providing a checkpoint at the entrance, you are able to control who comes in and out of the premises. Due to their relatively compact size, guard houses are almost always prefabricated and crane or fork-liftable or knocked-down and ready for instant assembly on site. The construction process of prefab shelters is quick and inexpensive, especially when compared with conventional building methods. While not intended for permanent installation, the guard houses are semi-permanent structures which can last for many years in one location. As relocatable buildings however, guard houses typically lack an attached foundation and are able to be moved around as and when needed. Guardhouses are manned by personnel and therefore require comfortable interior features. They are almost always insulated to maintain a comfortable interior temperature, and windows and doors allow for ease of vision and access respectively. Options such as HVAC systems, counters and interior storage, windows and doors, including sliding doors, phone jacks and rest rooms add to the livability of the space. Mostly used for security applications, these buildings are usually manned by a security contract company and are used to protect the people who protect the facilities. Therefore, guard houses typically have extra specifications such as bulletproof wall panels, reinforcing against vandalism, explosions and fire, as well as against natural disasters such as earthquakes or hurricanes. Guard houses are also constructed to withstand environmental effects such as extreme temperatures, rain and winds etc and have easy access and exit points. They are typically constructed from a durable and strong material such as steel and are sealed against leaks, typically with polyurethane sealed joints. Guard houses tend to be almost completely maintenance free due to their simple structure and construction. The outside of guard houses can be finished in a variety of different ways in order to blend with the surroundings, or to incorporate company colors into the exterior of the guard house. Coatings and paint can be used on the exterior and interior of the structure, and can be used for insulative, or heat rejecting layers. Depending on the size of entry point the guard house is protecting, and how many persons are working there, guard houses can range from small one-man size structures to larger multi-functional structures. Guard House Guard houses are portable buildings or shelters used at access points or checkpoints to provide security and accountability to the access restrictions of an area requiring authorization to enter.